Invisalign reviews and cost: Andrew Daddo's daughter on their decision. 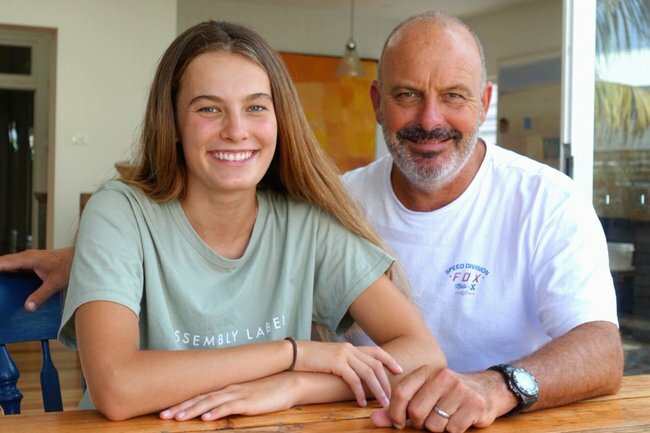 Andrew Daddo on his teen daughter's decision to get her teeth straightened. Whilst acknowledging and understanding a full and complete bias, there is not much I don’t adore about my kids. They are only distinguished by age: there’s my favourite and only son, my favourite oldest daughter and favourite youngest daughter. And, as much as I want to tell you about them all, today there simply isn’t time. So, this is about my favourite oldest daughter Bibi. She’s a ripper, a young woman embarking on her final year of school. As you’d expect, she’s pretty much perfect: To these eyes, anyway. Parental bias works a lot like that, though I’m not convinced adolescents look in the mirror and see quite what we see. Where we recognise youth and beauty and possibility, Bibi might see something different. We do agree on one thing, however. Her teeth. Do they pass muster? Of course they do – Blind Freddy can see she’s got a beaut smile. Whilst good at the moment, there was the question of the longer term. “Yeah, pretty perfect,” agreed my wife Jacquie. “But, you know…” And there it was. Really, her teeth were fine, even Bibi said so. But then, what if “fine” didn’t actually mean “fine”. What if “fine” meant not really “fine”? As parents with kids in their teens, we can easily add moments up and come back with some pretty funky results, and this may have been one of those times. But we were all due a visit to the dentist, and we might as well ask the question. So, we went to the dentist. Bibi asked about whether her teeth would stay the same, and whether those bottom teeth would just ‘line up’ over time. “He did that thing dentists do when they point out 15 problems in your mouth,” she complained to me. Even so, it was Bibi who had noticed her bottom teeth going into it – and I wouldn’t be the one standing in the way of anything that makes her feel more confident in herself. I was a little surprised that he thought there was some work to be done and noted a small smile on Bibi’s face when “Invisalign clear aligners” was uttered. I’d heard of them, of course, but didn’t really know much about them. I thought I knew about the cost, but that would be determined by what was needed. Basically, he said there wasn’t much to do to Bibi’s teeth. Invisalign treatment can be for a wide variety of teeth problems from severe to mild cases – and Bibi fits into the mild category. We weren’t looking at a total rebuild – it was a bit of tweaking here and there. There was a bit of a blur in the detail, but here’s what stuck out about Invisalign clear aligners over the alternatives like metal braces. They’re clear, removable and virtually invisible. For a girl like Bibs in her last year of school, the attraction seemed obvious. At a pinch, and for a short time, the clear aligner can be taken out. So that’s when eating, drinking or playing contact sport. That left everything on the table, if you follow. The ortho made it clear that Bibi could eat anything, without restriction. I loved that he leaned hard on the healthy examples: carrots and apples were fine. Corn could remain on the cob. Or popped, so she could eat popcorn! I don’t even know if she likes popcorn. Then he got to the nuts and bolts. When they’re in and in the process of straightening the teeth, they’re virtually invisible, so really, no-one needed to know she was undergoing treatment if that was what she wanted. And being renowned as the most advanced teeth-straightening technology available, it comes with some street cred too. It all sounded pretty good. There were some X-rays and flip top head style photos and these were used to show us what the state of her teeth really were. Healthy, for one, which was great. But as he pointed out, “…these could do with a little turning, this could do with a little straightening and if you start grinding your teeth (and pretty much everyone does it), I wouldn’t mind getting these lined up to minimise the damage”. So there was a short-term and a long-term view. As Bibi noted, a pretty much invisible short term, which was as important to her as her long-term dental health was to us. It’ll be interesting to see how it works out, and we’ll definitely give you an update. I wonder what other parents have done to help smooth the way to adulthood? Something like evening out a smile may not seem like a big deal, but then, perhaps, maybe it is. For a free online assessment, head to Invisalign Australia’s website. Andrew and Bibi will be updating us soon on how it goes – we’ll keep you posted. What’s something you’ve done for your kids that’s meant the world to them? Learn more about Invisalign treatment and see if it is right for you or your teen here.